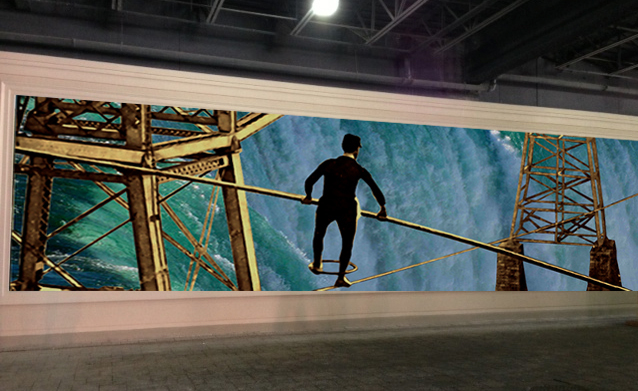 Daredevils crossing the falls on a tightrope and going over the falls in a barrel provided fantastic imagery for our latest art installation at the Fallsview Hilton. Visitors are greeted by a 47’W mural of a daredevil in the parking garage and the theme continues into the lobby with original oil paintings of the most famous heroes to brave the great falls. We also showcased the development of the huge generators by Nikola Tesla and George Westinghouse, shown in modern bright colors printed on brushed aluminum. For Brasa, the wildly popular Brazilian steakhouse, we created nearly 50 original works featuring gauchos, horses and saddlery, and Brazilian money and fruits. At the Watermark restaurant, we created artwork to echo the icy blue interiors, including the piece featured here.